To enter, simply leave a comment to this post telling us what your child’s or your own favorite lunch item is, and we will draw a random winner on October 14, 2009. Winners will get to select their own lunch bag style (Yum, Eat, or Tasty) to be included in the Square Meal Kit. Entries are limited to the continental United States. In case you missed it, check out our review of Soup to Nuts Kit by Citizenpip! My daughter is a huge apple fan and she has to have one in her lunch everyday. She also loves taking peanut butter and making her very own peanut butter and cracker sandwiches. Organic cheese sticks are also a staple. Thanks and good luck to everyone! My kids LOVE cheese sandwiches. I, on the other hand, am partial to steaming hot homemade beef stew. My kids love the new surprises I put in their lunches although I think mac and cheese and baked pasta might top their favorites. They also love what we call Snack Lunch – it’s a variety of high-protein, low dairy/gluten foods that was our first non-sandwich lunch experience. Since they rarely get sandwiches at school, sometimes they think that’s a little treat. My 2-year-old’s favorite lunch item lately is good old PB & J. She and her daddy make their lunches together…PB & J’s all around! My boy’s favorite lunch item is Lunchables or tuna sandwiches. I like to include some fresh fruit or veggies with it. Ryan’s favorite lunch item for school is organic red grapes. He LOVES them. Organic chocolate milk is a close second. Thanks for the chance at the giveaway. It looks awesome. My son’s favorite item is organic red grapes. He LOVES them. Thanks for the giveaway. It looks great! My kids love Sesame Bon Bons or RAW Bars for a healthy treat! Place all ingredients into a food processor, mix together till mixture forms a ball. Layer a glass pan with favorite crushed nuts then the fruit mixture, then layer crushed nuts and fruit. Place in cool place for about an hour. These are real easy quick and doesn’t take tons of measuring, just add what you like and kids love em! My kids love Seseme Bon Bons and Raw Bars for a healthy lunch treat, and of course fresh organic fruit is always a hit! My husband’s favorite are cheese sandwiches with homemade pickles. My son loves PB & Honey Sandwiches as well as Tuna- & he must have PB Pretzels! I’d love to get hime the Tasty set! While my eldest son loves variety in his lunch; everything from bento box hot items to sandwiches, my younget will only eat chicken nuggets! I wasn’t sure he was my kid when he started to like broccoli… but he is and he does. Must get it from his mother. Thanks so much for this great giveaway. My son’s favorite lunch item is apples. Very nice giveaway. Thanks. My son loves fruit snacks in his lunchbox. I love to put in apple slices and peanut butter. Yum! My son loves cheese in any way, shape or form. String cheese, grilled cheese, cheese sandwiches, as long as there’s cheese in that lunchbox, we’re good! My son loves it when we make his own lunchable with crackers, cheese, and ham. My sons both love plain yogurt with blueberries and honey as well as homemade roasted chick peas with garlic and thyme. My older son (just turned 4) has been heckled by his lunch companions (the lunchable and gummy snack set) about his lunches and his teacher has told me “he sticks up for himself and says ‘this is delicious and my mama packed it for me because she wants me to be healthy! 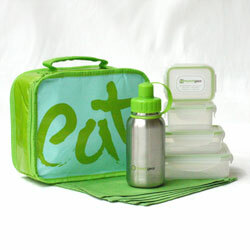 '” I use a nylon sack with pyrex glass dishes covered with rubber (for things that need to be heated), and old avent breastmilk storage jars for snacks and fruit for his lunch and a stainless bottle, but it’s a bit heavy and I think that if he had a lunch kit like this, maybe the lunchable and gummy snack set might change their tune. Thanks for offering this neat lunch kit! Mashed avocado (with salt and lime juice) spread on Wasa crackers. Yum! My kids love peanut butter and jelly sandwiches. My daughter hearts quinoa mixed with tomato soup. And cheese roll ups are always a hit. My favorite lunch item is whatever was for dinner the night before! Looks great! My son is loving tortilla spirals (filled with refried beans). Trail mix is a close second! Our lunchbox staple is sunflower butter sandwiches on sandwich round bread. They kids love ’em, and they’re super easy. My daughters favorite lunch items are Ravioli and fruit salad. She would eat both everyday. I love having fruit for lunch. Great pick me up in the middle of the day! We love home-baked macaroni and cheese for lunch. organic yogurt is a fav or ants on a log (celery w/peanut butter and raisens). I have heard of this line before and think that they have by far the coolest lunch bags. And I love that they are eco-friendly too! Definitely an added bonus. Well, I just had my first baby (a boy) 5 weeks ago, so right now all he is getting is breast milk, but I can’t wait until he is old enough for my to puree his food and when he is older make his lunches with sweet notes in there. And I will definitely make sure that he eats mostly all organic since that is a huge part of our lives. My sweet daughter loves hummus with carrots for dipping. Easy to eat and easy to share! Both of my daughters love oranges, especially the small satsuma variety and blood oranges. Tuna Fish Sandwiches with mayo, pepper and celery – of course. Simple and straightforward. Yum! At the moment, my daughter’s favorite is hummus with things to dip in it (but last week it was Sun Butter sandwiches). My 3-year-old has what he calls his “food line” which is code for the only things he will eat without arguing. It includes PB&J, quesadillas, apples, and shredded wheat. I guess it could be worse, but something from that list is breakfast, lunch and dinner every day. HA! Just one thing! My little 11 month old eating machine likes almost anything she can get her teeny tiny hands on such as bananas, apples, pears, pasta, whole milk yogurt, bread, cheese … and the list goes on! My girls & I are fans of leftovers. I love that it combines dinner cleanup & lunch making into one step! Although we homeschool, we’re out of the house more than in, so we are always taking food on the go with us. Our favorite is something we’ve coined to be ‘Blue Plate Special’. It’s essentially crudites with protein, veggie and fruit and is whatever is local, fresh and that we have on hand at the time. There’s at least 5 different items to choose from each meal so we can accomdate any picky-ness and there are endless variations so it doesn’t get old. I always like to take Wheat Thin crackers-so tasty! Love taking apples with us – they taste good, are fairly clean, no packaging waste, and travel well. My son loves crackers and cheese. Thanks for the giveaway. Homemade Mac and Cheese. No yucky powdered mixes here! My daughter loves good ol’ peanut butter and jelly. Thanks for the chance. My sone loves Almond Butter and Jelly on Ezekiel Bread with a banana. My favorite lunch item is … drumroll, please… PB&J!!! It’s my favorite because its fast and affordable. Thanks for the chance to win the good lunch sets! My daughter’s hands-down favorite is PBJ. I’m working on getting her to branch out a bit–maybe a lunch box like this would do the trick! My son loves ricotta cheese sandwiches cut into “triangles.” I think the triangles seem less overwhelming than a whole or half sandwich. If you take one look at me you can tell that I am not prejudice over taking one lunch or another to work but I would have to say my favorite is fresh killed tuna salad with pickles and fried onions served on a pita bread. My daughter LOVES mac and cheese, steamed carrots and flax seed bread 🙂 Love this lunch kit and I think she will too! My daughters favorite item is a chicken salad sandwich. No matter how I cut it there is never a trace left when she is done! My son loves organic cheese sticks in his lunch box, mostly because at 6 years old he is just having them for the first time, having outgrown his dairy allergy. The other thing he always loves is the note I include, a shape cut from a scrap of construction paper with a simple message about his day or reminder, some love, and affixed with a little sticker. My boys love to have peach chips in their lunch. I over dried a batch of peaches this year and they are more crisp than usual. They love them. A very happy mistake! My daughters favorite lunch item is hummus she makes herself (she’s 9) with homemade pita bread. She love to toss in spinach and sprouts too. Honestly, I like leftovers. Boring, I know, but then nothing goes to waste. We love to use hummus in our lunches as a sandwich spread or dip for veggies and crackers. We also try to include at least one fruit and veggie- some fun ones are jicama cut into french fry shapes and fresh strawberries. Our favorite item are our Klean Kanteens! They’re so perfect for drinks and save us money while we’re out, since we don’t have to buy plastic bottles. Whoops, I didn’t realize you meant a FOOD item. Our favorite is veggies and hummus! My favorite lunch item is the avocado in my salad. Just found your blog looking for BPA info. I will bookmark it! The kids love deviled eggs for lunch, along with fruit and cheese! Thanks for the giveaway. Our two boys loved their Mom’s take on sandwiches: Homemade white/wheat bread with homemade peanut butter and blackberry jam their aunt makes every year from a wild blackberry bramble on her farm. Second runner up is toasted bread spread with all-natural ricotta-cheese mixed with dried fruit. Third is thin thin slices of locally grown cheese on various homemade breads, raisin usually. Homemade muffins with cheese and fruit on super busy mornings, pluse sometimes, hand breaded allnatural chicken nuggets, they like them just fine cold in their lunches. I oven-bake them. my two year-old’s favorite lunch is plain pasta with parmesan cheese…and any kind of fruit! My son’s your classic peanut butter & jelly fanatic. Practically a food group to him. This lunchbox would be great for our forrest children group days! Thanks a lot for the give away! My 7 year old has allergies to soy, peanuts, shellfish, and eggs (not to mention dust, some trees, and grasses). Her favorite thing to get for lunch during school is home-made pizza, fresh green beans, and fresh fruit. She doesn’t eat lunch made at school due to her allergies, so we are always looking for new treats. She would enjoy the Square Meal Kit as it has the cool bag and containers to keep the food fresh. Thanks! My 2 year old son’s favorite lunch is a Nutella sandwich with strawberry jam. He loves pretty much any fruit, but his favorites are raspberries, blueberries, blackberries, & strawberries. I am so excited to have found this site and look forward to finding lots of ideas! My kids love it when we have left over pizza and I send it in their lunch boxes. my favorite lunch item hands down is any type of fruit. i really love having something like a mandarin or tangerine, but a chilled fruit salad is just theeee greatest! My daughter loves “spaghettios with the cat food in it”. No, I do not abuse her! She loves the meat in all that canned junk because she says it tastes like cat food – not that she would know what cat food tastes like because we only feed the stray cats dry cat food. But of course, this is the same girl who, at the age of 3, told me my perfume smelled like moon!! My daughter loves avocado, garlic jack cheese and organic grapes! My kiddo loves a good old grilled cheese sandwich on whole grain bread, fresh fruit or applesauce, and a whole-grain cereal bar. My son’s favorite lunch are Pita Pizzas. I cut a slit into the edge of a small pita pocket, and fill it with pizza sauce, shredded cheese, and a variety of other fillings depending on what’s in the fridge. (I’ve used sauteed mushrooms, chopped roasted vegetables, shredded chicken, etc. I’ve also added pureed or shredded vegetables to the sauce as well). Toast it in the microwave until the cheese melts, or warm it in a pan on the stove top, and you have an inside-out pizza! Quick, easy, healthy, and a relatively no mess (or at least, a less dramatic mess) for my toddler. My son’s favorite lunch is a “Pita Pizza” — I basically fill a pita pocket with pizza toppings, and warm it on the stove in a pan, or in the toaster oven. I fill it with pasta sauce, shredded cheese, and whatever other ingredients I have on hand (such as shredded chicken or leftover veggies from the night before). He loves these easy-to-hold, inside-out pizzas! My son love cheese and crackers with some fresh fruit. My kid loves pizza quesadillas. Simply put a flour tortilla in pan add cheese, sauce and fold over. Heat and serve. Super easy and the fact he enjoys them cold works for me. Cheese, crackers and dried fruit. My 5 year old granddaughter loves her PB & J most days. She’s rather eat pizza everyday! LOL! Her 2 year old brother will eat anything, but he loves oatmeal at lunch, not breakfast. He loves ham, cheese, whole wheat bagels, and bananas. Actually I am lucky most days he will eat everything I give him. My kids love pb & jelly. My daughter’s favorite lunch treats are homemade macaroni and cheese, cantaloupe, grapes, watermelon, mango and cheese sticks. We’re all huge fans of wraps instead of sandwiches here. Usually I’ll also pack a yogurt, peice of fruit, and granola bar. Ethan’s favorite thing in his lunchbox is cherry tomatoes… he can eat them by the pound!! Thank you for the giveaway! My childrens favorite lunch items when sent to school are peanut butter and jelly believe it or not. My son loves fresh fruit – melons and beries are his favorite! I love hummus and veggies for lunch. stuff celery with peanut butter and sprinkle a few rasins on top. I really love baked chips. They are essential in any lunch I pack. stuff celery with peanut butter and sprinkle with raisins. With three, three year old’s, every day is a new favorite for them. Tuna sandwich or a nice stir-fry – depending on how much time I have. I like a good fried chicken salad for lunch. I use deli chicken tenders or leftovers from dinner out. We used bagged greens and add dried fruit, chopped boiled egg, and cheese. It’s pretty quick and easy to make. My daughters favorite lunch item is cheese and crackers or edamame. Tristin loves cold, plain jasmine rice. My son’s favorite lunch item is a turkey sandwich with lettuce and mayo. My daughter’s favorite is carrots with Ranch Dressing. My granddaughter loves PB&J sandwiches. Egg salad sandwiches made with plenty of fresh dill and made on rye bread. my kids *5 & 3 years old* absolutely love having “breakfast” for lunch. they think it’s a riot if we have eggs or waffles or pancakes when we are not supposed to. it makes it fun for me too because they think something simple like that makes lunch-time more fun!!! Jeremy is a character when it comes to lunch and snacks. He is extremely picky. We do a lot of healthy fruits, such as apples, grapes, bananas and organic watermelon that we grew over the summer. Apple & Eve juice boxes and the capri suns (which we send to terracycle once a month for donations to his school)He loves his pb & j and trail mix, especially the nuts and raisins. I totally love cream cheese toast. I’m not that big on cooking yet, so something that’s good for you and that I will eat happily for breakfast and lunch at work is a rare find. I do my best to be healthy, so I stick to bread from the deli with lots of grains and nuts in it, or one of my favorites is olive loaf. This is especially great because sometimes you can find it on sale, and even though it’s got no preservatives, it lasts plently long in the fridge. We get bored fairly easily so the fave here is bento- each one is different with lots of little tastes. My daughter’s favorite is PB&J. My kids love PB&J sandwiches. My daughter likes turkey sandwiches, cut into heart shapes by her Dad. My daughter wants peanut butter & jelly EVERY SINGLE DAY!!! It’s easy but it seems like she’d eventually get tired of it. She also take a fruit/veggie and a small treat. Thanks. I bring the same lunch to school daily: yogurt, apple, and water. My kids really like Tuna sandwiches. My favorite lunch item is sushi. Quick easy protein. Sticky rice balls! Sushi rice squished together in ball form and packed with veggies. Fun to make and popular for grown up lunches too. My kids love edamame and lots of veggies! Ham sandwiches! An every day request. I love a peanut butter and jelly sandwich. What can I say it’s a classic! My favorite item is anything chocolate. I loved getting hostess cupcakes. I love to make my own soups and my favorite to eat for lunch is tomato basil soup. Very long day today at my day job, so I am sorry, the winner will be posted tomorrow (10/15). My daughter’s favorite lunch item is applesauce. My girls LOVE to eat quesadillas for lunch (or anytime). We also eat any kind of organic fruit (whatever we found at the store) everyday for lunch. 2 Red Hens Toy Nanny: Is it a blanket? Is it a toy tote? It’s BOTH! Green Family Values: Eco Gifts for a Green Father's Day Means Not Buying Anything!